A playground is a piece of land that is set aside for children's play activities. Most playgrounds are equipped with recreational facilities such as sandboxes, jungle gyms, swings and slides. These items, collectively known as playground equipment, are usually made of wood, plastic or steel, with surfaces designed for safety. Children enjoy playing with different play equipment at different ages, and a wide variety of commercial and residential playground equipment is available for children of all ages. Plan a home playground to meet the changing needs of your children as they grow. For children age 2 and under, different textures and color contrasts can stimulate their senses. At this age, kids like to crawl or are learning to walk, so consider areas for them to crawl as well as handles and small ramps to complement their mobility skills. Children age 2 to 5 like to crawl through tunnels, play in sandboxes, slide down small slides, play in playhouses, swing on swings, and ride on tricycles. Most playground equipment for children in this age group sits close to the ground to reduce the danger from falls. For children of ages 5 to 12, a wider variety of play equipment is appropriate, including horizontal bars and ladders, merry-go-rounds, monkey bars, see-saws, gym rings, sliding poles, and climbing walls. Playground-Playsets.com features a directory of children's playground equipment suppliers and playground safety and design resources. Many play items can be obtained online or from home centers, toy stores, or directly from manufacturers. Be sure to follow the manufacturer's instructions when installing playground equipment and accessories. Get matched to outdoor play equipment installers in your local area. Wooden swing sets, plans, kits, accessories, and playground equipment. Offers a series of unique playgrounds and play environments for children. Features wooden swingsets and playsets made of northern white cedar. Affordable and attractive equipment for all your commercial playground needs. Designs and builds innovative playground and skate park equipment. Outdoor & indoor playground equipment and playground parts for commercial applications. Manufacturer of children's park and recreation equipment. Commercial playground equipment, play systems, and play grounds. This color poster is designed to be printed on 8 1/2 inch by 11 inch paper. This series of publications by the US Consumer Product Safety Commission features a wealth of information about playground safety. 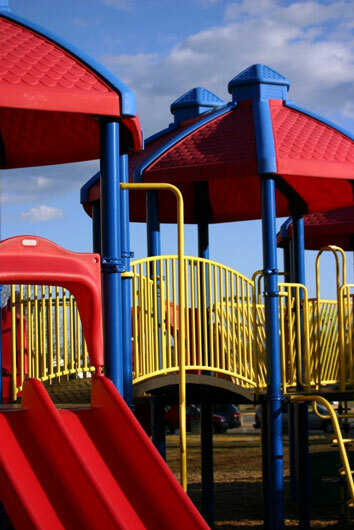 The International Play Equipment Manufacturers Association provides product certification services for public play equipment in the USA and Canada, and for public play surfacing materials in the USA. Directory of playground, park, and recreation products, equipment, and services. The KaBOOM! vision is a great place to play within walking distance of every child in America. The KaBOOM! mission is to create great playspaces through the participation and leadership of communities. Swing Sets - outdoor swings and play sets for children.